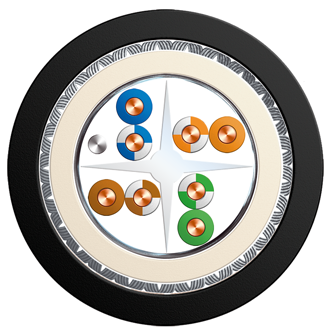 Armada® Cat6 24/1awg F/UTP GSWB SHF-1 | Belcom Cables Ltd.
DataGuard® armoured Cat6 F/UTP cable for analogue and digital transmission in the frequency range up to 350 MHz. It is designed for primary (campus), secondary (riser) and tertiary (horizontal) wiring. Use : 10/100/1000Base-T; CDDI/TPDDI; ISDN; ATM; 155 MBit/s, TP_PMD 125 Mbit/s, Token Ring 4/16 Mbit/s, analogue telephony.